Paul Gaugin was one of the leading French painters of the Postimpressionist period, whose development of a conceptual method of representation was a decisive step for 20th-century art. After spending a short period with Vincent van Gogh in Arles (1888), Gauguin increasingly abandoned imitative art for expressiveness through colour. From 1891 he lived and worked in Tahiti and elsewhere in the South Pacific. Gauguin’s art has all the appearance of a flight from civilization, of a search for new ways of life, more primitive, more real and more sincere. His break away from a solid middle-class world, abandoning family, children and job, his refusal to accept easy glory and easy gain are the best-known aspects of Gauguin’s fascinating life and personality. 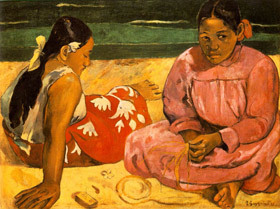 This picture, also known as Two women on the beach, was painted in 1891, shortly after Gauguin’s arrival in Tahiti. During his first stay there (he was to leave in 1893, only to return in 1895 and remain until his death), Gauguin discovered primitive art, with its flat forms and the violent colors belonging to an untamed nature. And then, with absolute sincerity, he transferred them onto canvas.